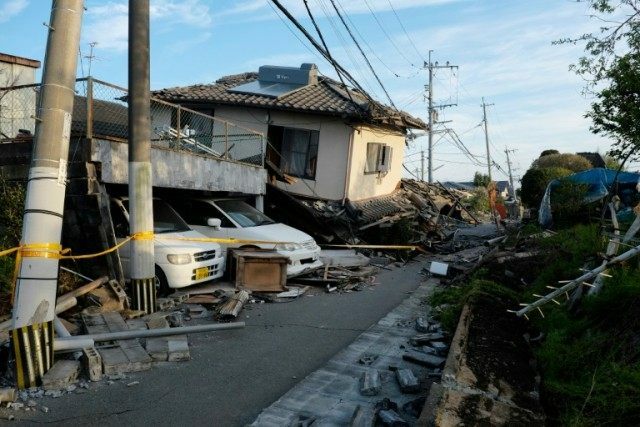 Minami-Aso (Japan) (AFP) – A more powerful quake hit southern Japan early Saturday, killing at least 10 people, toppling large buildings and triggering a massive landslide just over a day after an earlier tremor which left nine dead. Scores of people were feared trapped after the overnight quake on the southwestern island of Kyushu sparked a fresh wave of destruction in a region where nerves were already frayed following Thursday’s deadly earthquake. The powerful shaking set off a huge landslide that swept away homes and cut off a highway in one area, and unlike the earlier quake which mostly affected old houses, larger buildings were damaged and some toppled across Kumamoto prefecture, the epicentre of the quakes. The city office in Uto was badly damaged and said to be in danger of collapse, while aerial footage shot by broadcaster TBS showed the toppled centuries-old Aso shrine, its main gates flattened and wooden columns reduced to rubble. Separately, an active volcano in the area erupted Saturday morning, a local government official said, cautioning, however that it was unclear if the small-scale event was linked to the quakes. Tomoyuki Tanaka, an official with the Kumamoto prefectural government, said 10 were confirmed dead after Saturday’s quake, bringing the total since Thursday to 19. Public broadcaster NHK, meanwhile, put Saturday’s death toll at 15 and said there were at least 760 people injured, while a government spokesperson said scores were trapped or buried alive. There were also 11 people stuck in a damaged university apartment building in Minami-Aso near the landslide, another prefecture official said, adding their condition was unknown and it was unclear if all were students. TBS said seven of them had so far been rescued. Meanwhile, a large fire that broke out at an apartment complex in Yatsushiro killed one person, city official Kiichiro Terada confirmed. In nearby Kumamoto city, authorities evacuated patients from a hospital over fears it could collapse and images showed the tilted building. Hisako Ogata, 61, evacuated to a nearby park with her daughter, where some 50 other people sat on blue plastic sheets. “We left my house as we could not stay due to continuous jolts,” Ogata told AFP. An AFP journalist in the city at the time said he was jolted awake by powerful shaking, which sent the television set in his hotel room crashing to the floor. Staff urged guests to evacuate. Kumamoto airport was forced to close after a ceiling collapsed from the shaking, Jiji Press reported, with no immediate plans to resume flights, and communications in the area were spotty. Japan Meteorological Agency official Gen Aoki said Saturday’s quake was the strongest to hit in recent days, and that Thursday’s was merely a “precursor”. The US Geological Survey measured the quake at magnitude 7.0, or 6.3 times bigger than the 6.2 tremor recorded on Thursday. The quake struck at 1:25 am (1625 GMT Friday) at a relatively shallow depth of 10 kilometres (6.2 miles). Japan Meteorological Agency, which put the magnitude at a revised 7.3, initially issued a tsunami warning for the western coast of Kyushu but later lifted it. Shotaro Sakamoto, a Kumamoto prefectural official, said the quake felt comparable to Thursday’s. “It was really strong… many people on the street appeared panicked,” he told AFP. Some 20,000 personnel will be deployed to the area over the weekend to help rescue efforts, Defence Minister Gen Nakatani told reporters. Prime Minister Shinzo Abe convened a disaster taskforce meeting in Tokyo, a spokesman at his office said after the premier’s visit to Kyushu to inspect the damage from the earlier quake was cancelled. A nuclear plant on Kyushu was unaffected by Saturday’s quake, Chief Cabinet Secretary Yoshihide Suga, the top government spokesman, told reporters.